Healthy Soil for Trees | John B Ward Co.
Zack Johnson uses the air spade tool as part of the root invigoration process. 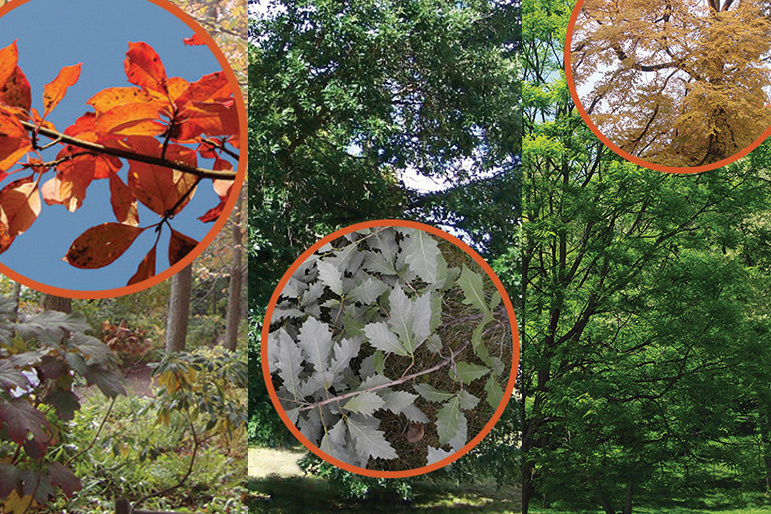 The ideal environment for trees to thrive in is their natural element — a woodland setting with leaves decomposing under the canopy, making the soil loamy with lots of organic matter and microorganisms. Unfortunately for trees, the environment around our homes is often dominated by turf. Each fall, all the leaves are quickly removed so that, after many years, the soil is starved of natural nutrients. Often, the ground is severely compacted by foot traffic and heavy lawn mowers. Throw in a couple of construction projects, a Fios line and a trench for the new generator, and an extremely stressful soil environment is created for our tree canopy. The good news is that we have proven techniques to help. In addition to injecting liquid fertilizer and organic soil conditioners, we also perform vertical mulching and root invigoration of the soil under trees. 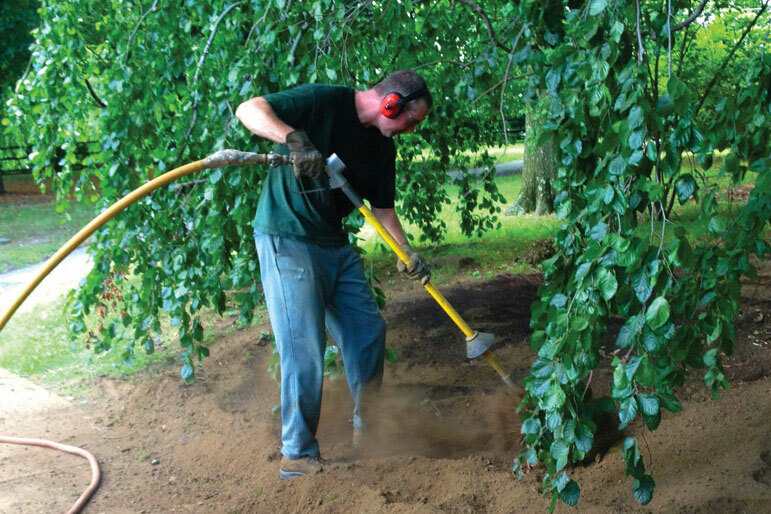 Vertical mulching is the process of drilling holes under the drip line of trees with a 2.5-inch diameter auger. 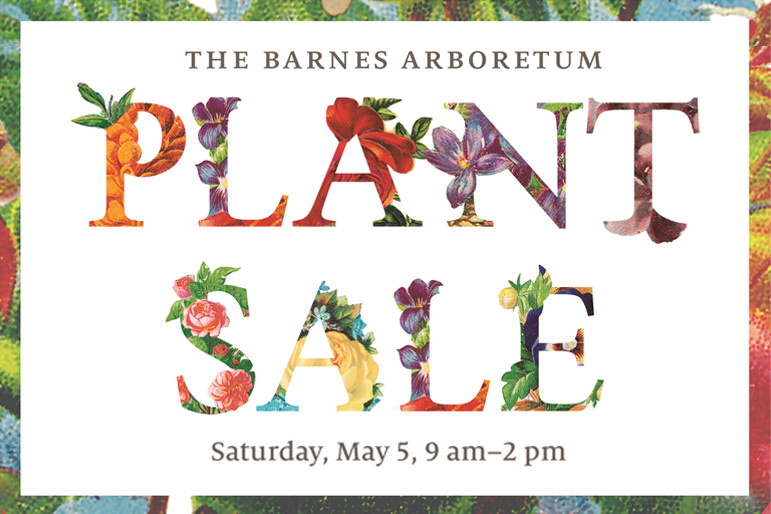 We drill holes up to 18 inches deep at about two-foot intervals under the entire canopy. The holes alone are beneficial: oxygen can enter the soil, gases can escape, and soil moisture levels in the upper profiles of the soil can be improved. We fill the holes with a combination of Bio-Char charcoal and a compost blend we purchase in Lancaster. These two products energize the soil in different ways. 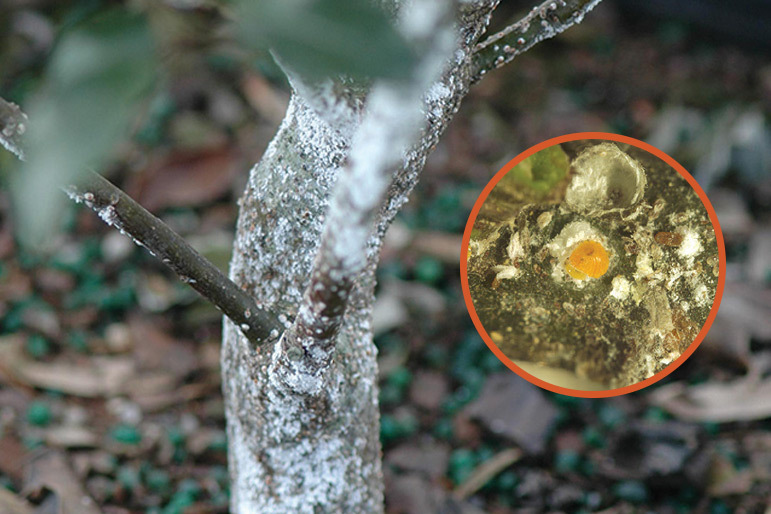 The compost blend increases microbiotic activity and suppresses some aggressive root and stem fungi that attack the roots of trees and shrubs. The Bio-Char is organic matter that is not fertilizer — it acts as a soil invigorator. The combination of compost and Bio-Char quickly provides a powerful soil therapy that gives plants an exponential energy boost. 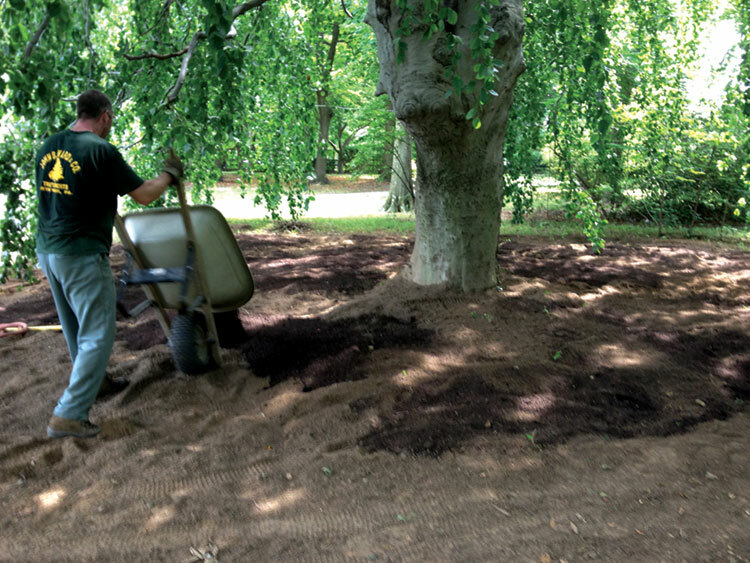 Zack Johnson adds compost and Bio-Char to the root zone of a weeping European beech tree. Root invigoration takes vertical mulching to the next level. In this process, we use a tool called an air-spade to churn the dirt into a fluffy, pliable medium. The air-spade produces high-velocity air that does not damage roots and enables us to blend the existing soil with our compost blend and Bio-Char. Rather than drill individual holes, we churn an area as large as possible under the tree or plant canopy. To finish the project, we mulch and then drench the critical root zone with Kick root stimulant. Our goal is to increase the capacity of soil to function as a vital living ecosystem. We are happy to discuss these processes with you and make recommendations based on your individual landscape and soil conditions.